I put on my dusty pixel-hat after a long while. Dodonpachi inspired. HUD text is a little hard to decipher quickly, with the horizontal lines in the characters. Pink and green ship doesn't have enough sharp edges and details to feel consistent with the other ships. It's almost "blurry" by comparison. The dark blue foggy/cloudy shapes drawn on top of the black bg looks really rough. Like a 5 second brushing, just testing an idea. I like the way it breaks up the solid black bg, but more refinement could improve it. I'd love to see the orange samurai mech dude animated. Oh, I just noticed the 'P', in the right. I think they could stand out more. This is just a still, though. When things are moving they automatically distinguish themselves better. You have a keen eye. I'll have to make a real bg. Of course I just had to start with the most fun bit, so I animated the mecha. It's a bit rough still. Hey, that's a snappy animation! Very attractive. Almost squirrelsquid-ish! I'm hoping for some sweeping katana attacks, too. The halos (in fact mere rings) around the "P" powerups are unneeded, huge and less detailed than the rest. If you want something animated in your powerups, glittering moving reflections on metal or spinning "coins" are proven designs that look familiar and don't increase the effective size of the item. The letter is too large relative to the black background; you might extend the center one or two pixels in all directions at the expense of the purple outer part to improve proportions. The shading is good, but the light source is diagonal! You should be able to redraw it equally well with the correct frontal light source. 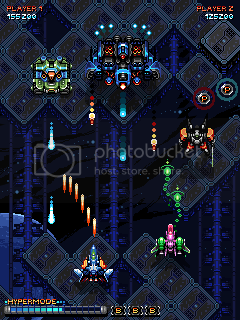 Maybe it looks better in motion, but the blue shot from the middle enemy is pillowshaded and lacks brightness. If the dark blue disks are a burst of shots, the rear ones should be identical or even brighter than the first one; if they are a trail, they should be continuous (similar to the shots from the green enemy on the left). Well . . . those are quite some opinions there . . .
Maybe it looks better in motion, but the blue shot from the middle enemy is pillowshaded and lacks brightness. . .
Pillowshaded? Really??? What, pixel artists can't create shapes with even, border-following shading any circumstance? Make an edit of how you'd "fix" the projectile in question. It's a mecha, so it's free not to be bound by human anatomy, but I intuitively expected the torso and left shoulder to rotate together with right shoulder when it aims before shooting.